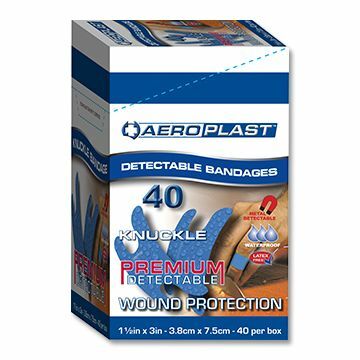 The AeroPlast Premium Detectable plaster is a premium latex free, hypo-allergenic, visual and metal detectable plaster specifically designed for the food manufacturing and processing sector. AeroPlast Premium Detectable has multiple detectable attributes. The first being it’s vibrant blue colour, which is the only colour that does not occur naturally in food, making it easily detectable. The second feature is the ability to be detected where metal detection equipment is operational. The ultimate in high security. SupaBond adhesive, exclusively engineered for unrivalled adhesion, provides a secure adhesion across the site, preventing lift up or edge curling. The unique specifications of film and adhesive are key to the products reliability, ensuring that no matter how wet, steam-filled or hot the environment becomes, this product cannot become separated from the wearer. 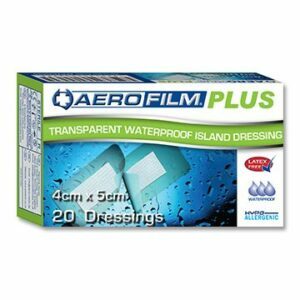 Aeroplast Detectable is made with the ultimate in film technology, providing a bacterial barrier which resists the ingress of water, oil and grease. 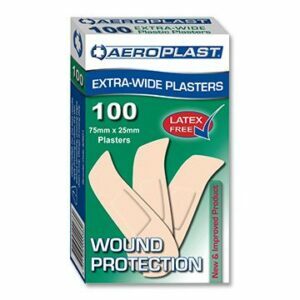 The standard plaster size is larger for even greater wound isolation. 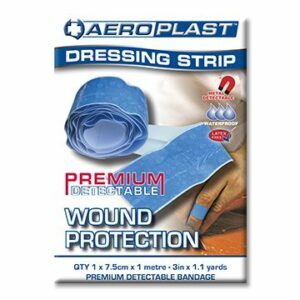 There is an AeroPlast Detectable dressing for any application with specialized fingertip, finger extension and knuckle dressings, large and small patches, standards and extra wide plasters and a dressing strip that can be cut to size to suit awkward wounds. 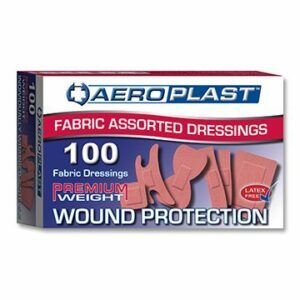 A wound in the food processing industry can always be safely cared for by insisting on AeroPlast Detectable.